This Man and Machine Petite Mouse is specifically designed for use in medical applications. 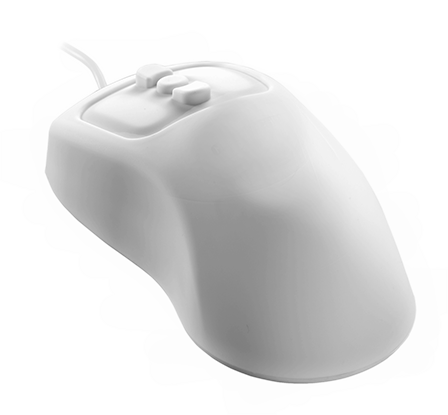 It is full sized and features a 5 button design for left and right clicking and scrolling up and down just like a conventional mouse. This Petite Mouse has a sealed silicone body and comes with an IP 68 rating meaning that it meets the highest standards for water and dust resistant. This Man and Machine Petite Mouse is waterproof and chemical resistant so it can be disinfected with standard cleaners and disinfectants, alcohol and even 10% bleach solution.